Architects, architecture firms, and advocacy groups continue to denounce the American Institute of Architects (AIA) and more specifically, AIA CEO Robert Ivy over a tone-deaf post-election memo issued by the figurehead pledging support for President-Elect Donald Trump’s so-called infrastructure initiatives. The memo, which used open-ended language to embrace the candidate’s pledge to embark on a $500 million infrastructure program, has been panned across the field for ignoring the openly racist and climate change-denying rhetoric propagated by the now-incoming administration. UPDATED: AIA pledges to work with Donald Trump, membership recoils. As a result, the statement—which stood in stark contrast to many of the AIA’s own stated social and environmental professional and policy goals—alienated and potentially endangered rank-and-file AIA membership, especially women and members of minority groups. The Architect’s Newspaper (AN) has been collecting the outpouring of criticism and commentary over the last few days, as wave after wave of individuals, firms, and organizations continue to speak out against the AIA and Ivy, with a growing chorus calling for the CEO’s resignation. Attempts Monday night to quell the backlash have involved a flat-footed apology issued Satruday night as well as a more heartfelt video apology posted online by AIA National president Russ Davidson issued a recorded apology Monday night that has apparently fallen on deaf ears. See below for a selection of statements collected from comments on our Facebook posts and articles, as well as direct messages to the AN editorial team and public press releases. The elected leadership of AIA San Francisco (AIASF) met this afternoon and dedicated a significant portion of its board meeting to discuss the post-election statement issued by Robert Ivy, FAIA, of AIA National, made without our input or knowledge, that purported to speak on behalf of its 89,000 members. As many of you have expressed to us over the past week, this message does not represent the view of our members, nor did it communicate the ethics or core values of the Institute. AIA National has since issued a video apology. AIASF is non-partisan and does not support candidates. We support policies. We would like to reassure our 2,300+ members in the Bay Area that we will continue to advocate for equity, diversity, inclusion, resilience, and for the advancement of the profession, built environment, and success of all citizens on behalf of its members. We remain dedicated to advancing equitable practice in the workplace and the communities we serve. We recognize that our environment and climate are changing, and resilience of the built environment and continued commitment to AIA’s 2030 initiatives are paramount to the continued success of our society. We are San Francisco, and are fortunate to practice in one of the most diverse and inclusive cities in the world. AIASF will continue to serve as the collective voice of progress, empathy, and inclusion, and urges AIA National to operate with the same considerations when it speaks on behalf of all members. AIASF is our organization – we are comprised of individual members, and our members contribute to our collective strength. We encourage you to reach out and join us with your thoughts – positive, negative, neutral – so that we may collect and share them with AIA National. Our first action is to convene a town hall meeting on December 2 from 3:30 to 5:00 PM at the AIASF headquarters office. With your input, we will craft an action plan designed to continue to affect positive change in our professional association, our community, and the built environment. “In the wake of the response by AIA members to AIA CEO Robert Ivy’s post-election statement, the Texas Society of Architects (TxA) would like to reaffirm our core values. Above all, TxA is committed to being the voice for Texas architecture, supporting the creation of safe, beautiful, and sustainable environments. Furthermore, TxA stands behind AIA’s stated Diversity and Inclusion Goals (see below). TxA acknowledges that much of the presidential campaign rhetoric, prior actions, and statements of the president-elect seem to be in contradiction to our core values and those of the AIA. We anticipate learning more about the intentions of the new administration in the coming weeks and months, and will support those policies aligned with our core values and speak out against those which are not. TxA and its membership will continue to promote the design of spaces that serve our communities and are inclusive, as well as continuing to seek greater diversity within the profession, no matter which political party is in the majority. Architects have an important role to play in designing and building a more prosperous, peaceful, and sustainable society for the future. We know architects of all political parties will continue to use their skills and voices to promote the highest ideals of design, as our aging infrastructure is renewed, as well as the ideals of our nation, including life, liberty, and justice for all. The statement made post-election by AIA National on behalf of you, the largest chapter within its network of 89,000 members, pledged your support to an administration that many strongly denounce. The Board of Directors of AIA New York was not consulted by AIA National leadership prior to their decision to support President-Elect Trump’s yet undefined infrastructure agenda, and we do not condone their statement. Architects, by training, are fundamentally committed to providing shelter and protecting the safety and wellbeing of all people. Civil dialogue, reciprocal respect, and the protection of human rights are essential to this activity and are vital characteristics of the profession. These principles are not only our human values; they underpin the practice of our profession. We believe in equity in design and its benefits to all, especially in the critically needed areas of affordable housing, safe schools, and accessibility. We will continue to espouse fair and ethical business practices throughout the building industry. And, we remain committed to mitigating climate change and protecting New Yorkers from its unavoidable consequences. We are fortunate that the New York Chapter functions in one of the most diverse and inclusive cities in the world. To this end, AIA New York is committing to increasing programming and exhibitions that promote a more inclusive America and address the needs, concerns and principles of you, our members. We are first and foremost a membership organization, and our members are our strength. As members, your insights will drive our future actions. We want to hear from you. Please email membervoices@aiany.org with your suggestions for how this organization can best respond to the challenges you see facing us as a community. We are committed to addressing your concerns. “As a national organization that has representation in each of the 50 United States, the AIA is in the unique position to frame a conversation among what is, no doubt, a politically diverse constituency. “The United States is about to pass through what is perhaps its worst crisis since the Civil War. The First Amendment of our Constitution states that, “Congress shall make no law respecting an establishment of religion, or prohibiting the free exercise thereof; or abridging the freedom of speech, or of the press.” The President-Elect, meanwhile, has promised to place a moratorium on the entry of Muslims into this country; he has incited racial hatred and has sanctioned sexual assault; he abhors dissent. His views pose a mortal threat to the liberal principles on which our social institutions—our schools and universities, our professional organizations and civic bodies—rest. His promises—yes, his promises—have compelled states such as New York and California to reaffirm their sacred obligations to their citizens. They have compelled schools and universities around the country to the same. It appears inevitable that the Trump presidency will cause a constitutional crisis once his tenure begins. That the AIA chose last week to offer a categorical pledge of loyalty to the President-Elect is beyond comprehension. It reminds me of similar pledges that the Confederation of German Architects made in Nazi Germany. That it did not consult its membership prior to issuing its memo makes me sad for this country, very sad. It suggests that some of us have already forgotten what it means to live in a democratic society. It also tells me that maybe, just maybe, some of us may not even care. The AIA’s actions represent a violation of its core mission, as the editorial board of The Architects’ Newspaper rightly and so courageously note. They represent a betrayal of trust to the AIA membership body. They have further endangered the lives of those which the incoming administration has demonized. They may also be illegal, especially if, as I anticipate, a constitutional crisis announces itself on January 20. “What a remarkably missed opportunity. We live in a continuously evolving world and our role is to foster that evolution rather than to abet in the construction of a world that no longer exists. We were dismayed to read this week that, as members and supporters of the AIA, we had offered our unqualified support for President-Elect Trump and the 115th Congress. We are ashamed that our professional organization decided that the prospect of public commissions for a very few of us was important enough to silence concerns about the specter of an anti-elitist society defined by racism, misogyny, xenophobia, and the denial of science. As members and supporters of the AIA and Equity in Architecture, we have worked hard to demonstrate that our profession, like our society at large, harbors systemic racial and gender biases that have real impacts upon our professional outcomes, and upon our firms’ bottom lines. This work demonstrates that our profession continues to overlook this systemic injustice at our own peril — we are losing talent by failing to create healthy, equitable, meaningful and culturally diverse work environments for all professionals. Please recognize that, in word and in action, you perpetuated our profession’s white, male privilege when you offered the Institute’s support for a person known for promoting a worldview that threatens to pit us against one another on the basis of our race, gender, creed, or sexual orientation. These beliefs do not reflect who we are, nor do we believe that they reflect the core values we are responsible for upholding as a profession. These include: sustainability through dedication to climate action, promotion of domestic and global projects that are humane and socially just, and equity, diversity and inclusion in both practice and representation. Chancellor Merkel’s statement on the election, which declares that her country and ours share common values of “democracy, freedom, the respect for the law and the dignity of human beings, independent of their origin, skin color, religion, gender, sexual orientation or political position,” is exemplary as a way in which the AIA could have offered qualified support for the new administration on the basis of our values. Yes, we believe in infrastructure, but that belief is subsidiary to our belief that we have an important role to play in building a just, fair and transparent society. As architects, we are often tasked with working on behalf of many while in consultation with a powerful few. It is our responsibility to reflect and protect the communities that we serve, which often means advocating for those who haven’t been included in the decision-making process. We do not simply provide our clients with what they initially tell us they want to see, but instead work with them to envision a future in which they are their best selves and protect our planet for future generations. This is what architects do. This is the value that we provide, and the basis for our continued relevance. In offering our profession’s unequivocal support for the incoming administration, we believe that the AIA has fallen short of our duty to the communities that we serve. We have failed to speak truth to power, and have instead offered a willingness to capitulate to an unpardonable worldview because we are enticed by the pursuit of new commissions. We have countermanded years of hard work on our profession’s relevance and on equity within the profession with a statement that suggests that we are simply “yes”-people who rubber stamp the beliefs of those who pay our bills. We owe our society—and each other—better than this. In the very near-term, we would urge the AIA to establish an ongoing—and public—forum in which leaders from all levels of practice are invited to reflect upon the Institute’s core values, and the value that our profession provides to society. This could be launched at the national plenary broadcast of the Center for Civic Leadership’s Forum on Friday, November 18th. In addition, we believe that the AIA must reaffirm that equity, diversity and inclusion is central to our professional mission. The upcoming Build America Summit on November 29 – 30th, hosted by AIA President Russ Davidson, affords our profession the opportunity to declare that we must renew and rebuild our country’s social infrastructure upon the basis of mutual respect, empathy and concern for the health, safety and well-being of all who live in our communities. We would hope that this issue be addressed in the opening session on “Neglect, decline, and consequence,” and featured in any policy recommendations that are delivered to the incoming administration. In the long term, we look forward to continuing to work with the AIA to foster and advocate for a profession that exemplifies sustainability, equity, diversity and inclusion by championing the communities that we serve. Equity is for Everyone. “On November 9, 2016, the American Institute of Architects resigned itself to a cowardly position of economic and political subservience with its support of President-Elect Trump. The AIA’s refusal to take a principled stance on an incoming administration that galvanized support through hatred, divisiveness, and fear constitutes an abdication of its self-proclaimed responsibility to speak on behalf of architects and a contradiction of its own stated beliefs. 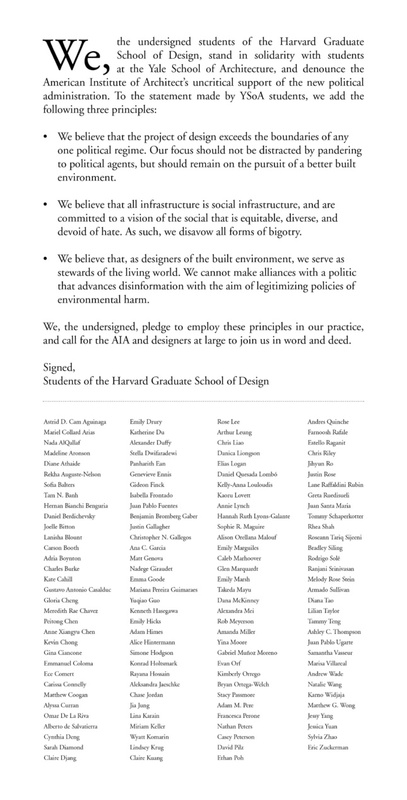 We, the undersigned students of the Yale School of Architecture, unequivocally denounce the AIA’s endorsement of the new status quo. For too long, our profession has been complicit in giving form to landscapes of inequality and discrimination, and has itself been plagued by a history of racial and gender inequity. The AIA’s immediate and unquestioning pandering to the Trump administration threatens a continuation of our troubled past and demonstrates a willingness to pursue financial gain at the expense of our values. With the promise of renewed federal investment in infrastructure, the position of architects as conscientious stewards of the built environment has never been more important. It claims to promote “design that engenders greater community health [as a] way to not only save costs, but to enhance the lives of individuals.” These principles must not bend to opportunism in the face of a new administration. If we are to unite in the best interest of America’s future, it will be with our values intact. We cannot afford to relinquish the agency of our craft to those who would use it for self-serving political gain. We have an ethical responsibility not to erect walls that divide, but to lay the foundation for a more unified, just, and safe society. We believe in the social value of architecture and the moral agency of architects. We believe human values are more important than material values. We will work to mitigate the effects of the built environment on climate change. We will resist individuals, institutions, and systems that exploit people and land for power and profit. We will continue our commitment to promoting equality and diversity within the profession. “Fellow Architects, this is a call to action. The AIA National statement is flawed in so many ways, and I am grateful to all of you for calling it out. By writing and sharing your opinion, you are taking action. This is the most important thing we must do now. In taking action, we must also do so smartly. Having been a Board Member of AIA Chicago in the past, and being connected with the broader AIA community ever since, I know, without a doubt, that the AIA statement is a case of a well-intended communication poorly executed. Today, we need AIA more than ever before. This is no time to pick the wrong fight. By confusing the goal to remain bipartisan with the urgent need to aggressively call out attention to such issues as 97% scientific consensus, the AIA is proving its own limitation. But remember, we are AIA. The ultimate responsibility to figure this out rests with us, the members. We have to take this into our own hands, get organized, and force the change we know is needed. This approach will strengthen all AIA efforts as an added benefit. Our grass roots coalition, Architects Advocate for Action on Climate Change, revolves around one specific topic for the sake of focus. However, now is the time for our platform to be adopted by any and all of you: I ask you to launch Architects Advocate for Action on Affordable Housing, Architects Advocate for Gender and Pay Equality, you name it. Take it and run with it. Your actions will speak louder than your words. With regard to Climate Change, we are facing an emergency. The President-elect has called human-caused climate change a hoax, has vowed to dismantle the Paris Agreement that sets targets to reverse the worst effects of global warming – which nearly 200 countries agreed to last December – and has tapped a climate-change skeptic to oversee the transition of the EPA. In order to get ready and organized to fight the impending assault on scientific consensus, healthy and livable communities, and reason, we urge you to join Architects Advocate for Action on Climate Change: www.architects-advocate.com. Today, there are over 150 architecture firms nationwide in our coalition, but we need 1,500. Fast. Architects Advocate for Action on Climate Change plans to send a letter to every U.S. Congress member, as well as the President-elect, detailing the case for needed Action on Climate Change, and imploring all elected officials to support the Paris Agreement. We plan to list the names of every supporting company on the letter. It is important to remember that only a minority of members of Congress, approximately one third, are denying climate science. The other two-thirds acknowledge the scientific consensus and already support action or are likely persuadable. There is a silver lining as a result of this election if we – the architecture profession – are ready to seize it. This can become the moment in time when we architects realized that being apolitical is no longer an option. Being political does not mean fueling the flames of partisanship, on the contrary. It means recognizing the urgent need to engage more effectively where decisions are made that affect us all. We can demonstrate what it means when citizens take their civic responsibilities seriously, and we can model the kind of behavior we wish to see in others. AIA Chicago vows to continue work that is already underway to give all members a voice on how these goals can be achieved now and long into the future. To do this, we need all of you to continue to engage in the work of our chapter and continue to express your views and opinions. It is in working together that we can accomplish the most and make the greatest impact. We wish to reaffirm our commitment to AIA’s goals of Diversity and Inclusion, Sustainability, and Resiliency, and the fundamental belief that architects have the skills and resources to serve the greater needs of our communities. We believe this is the message we should be sending to both Presidentelect Trump and the 115th Congress. “After taking a few days off to regroup and process what our work means in the face of a Trump presidency, QSPACE is now ready to act. AIA CEO Robert Ivy’s comments that “The AIA and its 89,000 members are committed to working with president-elect Trump” are unnecessary, tone deaf, and an insult to to marginalized groups within the architectural field. We call on Robert Ivy and the AIA to clarify their statement and to explain how they will work with the Trump administration in compliance with their own ethics policies. Rule 1.401 states “Members shall not discriminate in their professional activities on the basis of race, religion, gender, national origin, age, disability, or sexual orientation.” Donald Trump has proven time and time again that he does not intend to run a country that treats people equally. And how will the AIA still advocate for sustainability (Rule E.S. 6.3) with a president who doesn’t believe in climate change? 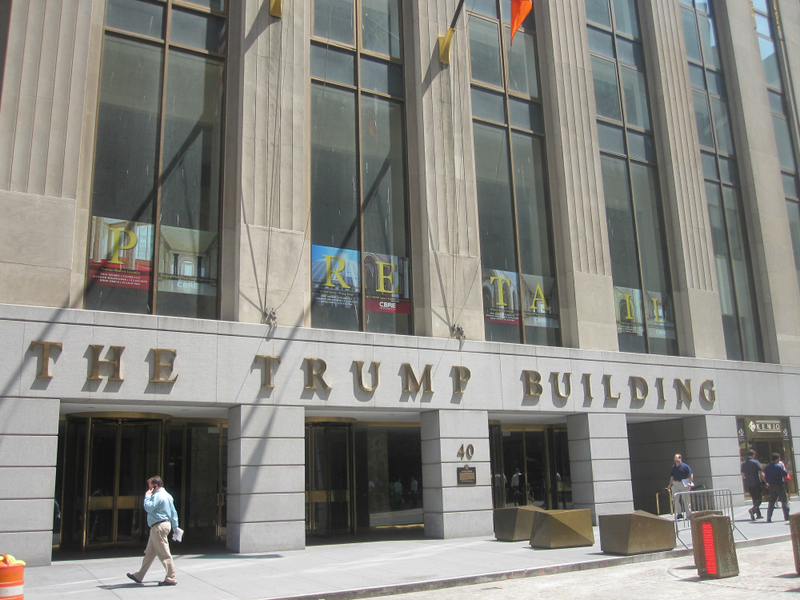 Will the AIA address the treatment of architects who have been cheated out of pay by the Trump Organization as they pledge architects’ commitment to work with him as President? We are scared. We are angry. We are determined. We will speak out. We will act. We have a lot to of work to do. Years of progress for the LGBTQ community under Obama are under threat. As LGBTQ people, we must actively lift up the most vulnerable members of our community: transgender people, people of color, immigrants, women, queer people in less-tolerant demographics, and other folks marginalized by Trump. As architects, we must promise to design a more inclusive future for all. “Full disclosure, I’m not an AIA member. I’m the director of SCI-Arc and I cannot assume that everybody thinks in the same way in our school , so my comments are coming from my own points of view. I am disturbed that the leadership of the AIA decided to speak on behalf of its entire 89,000 member constituency, and by implication architects in general, without consultation and public debate. Beyond the process by which it was released, I thought the statement itself was insensitive and tone-deaf to the tensions of this moment in American history. It seemed overly focused on commercial opportunities and blind to other demands for service to the public (which incidentally is an entire section of the AIA’s own code of ethics). Architecture is not just a business. It is also a way of representing in built form what we think is important. It is a platform for questioning what we thought was important in the past. It is a way of working that enables necessary conversations in the present. If the AIA becomes nothing more than a lobbyist for the commercial interests of the largest corporate architectural practices, architects should question what their membership in the AIA actually means. “I am not a practicing architect, but I found the AIA’s rapid embrace of Donald Trump’s infrastructure program to be deeply troubling. We have few details of this program, but all of the campaign rhetoric thus far suggests that this “infrastructure” program is nothing short of a massive attempt to privatize public resources and amenities, akin to this administration’s recent proposals to replace Medicaid with a privatized voucher system. “OK, fine, let’s imagine that a certain degree of pragmatism might guide some decisions right now – that Trump might surprise us and take a more functional problem-solving approach to investing in public infrastructure. The problem for us is that problem-solving or business smartness without ethics, and without respect for human dignity, and without a sensibility towards social justice… is simply just business. The AIA should not consider this business-as-usual and remain politically neutral. To maintain impartiality in face of today’s social and economic injustices is to be complicit with those institutions that perpetuate what is ethically and morally wrong. Where was the AIA during Trump’s campaign’s denigration of immigrants, the overt drive for more privatization at the expense of our collective assets, and the proposal of building a border wall? This should have been the best time for our profession to take a position about what is ethically and morally wrong: That xenophobia is wrong, that inequality is wrong, that building border walls is wrong. OK, fine, as a profession we have never been that interested in considering what is ethically and morally wrong. Ask Albert Speer. The commission is all we want. So we say: Let’s engage this commission because it is about public infrastructure, and if we don’t, someone will (this has always been our excuse to ignore ethics). But have we asked how Trump will pay for his public extravagance? Are tax cuts for the very wealthy and the erosion of our social safety net the building blocks for his investment in public infrastructure? Are we that naïve? Here is where the AIA needs to take an even more political position: we need to say it aloud: Taxes are our civic duty, because they are the basis for realizing our collective commitments and shared interests. We also need to demand a more enlightened government to invest this revenue smartly and efficiently – our bureaucracies need to be re-designed. The future of our cities depends on this double project of progressive taxation and public imagination.